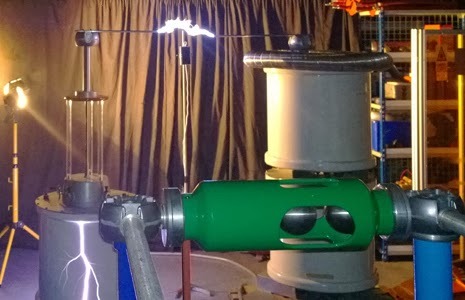 Scientists from the University of Southampton have collaborated with Nokia on ground-breaking, proof-of-concept research into harnessing the power of lightning for personal use, an industry first that could potentially see consumers tap one of nature's significant energy sources to charge their devices in a sustainable manner. With the help of scientist Neil Palmer of the University's Tony Davies High Voltage Laboratory - one of the world's leading high voltage laboratories - research was undertaken to investigate how natural power resources could be used to a charge a Nokia Lumia 925 with an energy simulation similar to that of a bolt of lightning. "We were excited by this challenge presented to us by Nokia. Using an alternating current driven by a transformer, over 200,000 volts was sent across a 300mm gap – giving heat and light similar to that of a lightning bolt. The signal was then stepped into a second controlling transformer, allowing us to charge the phone," Neil said. "We were amazed to see that the Nokia circuitry somehow stabilized the noisy signal, allowing the battery to be charged. This discovery proves devices can be charged with a current that passes through the air, and is a huge step towards understanding a natural power like lightning and harnessing its energy," he added. This experiment underlines Nokia's 150-year commitment to innovation and delivering the most pioneering products to its customers. That the Lumia 925 could withstand this sort of experiment is testament to the renowned high quality and durability of Nokia's devices and the company's continuing research to increase the already outstanding reliability of its products. "This is a first for any mobile phone company to trial this kind of technology. We obviously aren't recommending people try this experiment at home, but we are always looking to disrupt and push the boundaries of technology and find innovative ways to improve the performance of our products," said Chris Weber, Executive Vice President for Sales & Marketing at Nokia. "As one of the first companies to introduce wireless charging into our products, we believe that this experiment has the potential to jump-start new ideas on how we charge our phones in the future."